If you have a new or vintage natural fur coat or any garment trimmed with animal fur, it takes special care to keep it looking its best. If you bought the garment used and are unsure if the fur is animal or synthetic, the first step is to do a burn test. Simply snip a few strands from an inconspicuous spot. Place the fur strands in a heat-resistant dish like an ashtray and light with a match. Natural animal hair will burn quickly to ash while synthetic fur will melt. Now that you know that you have animal fur keeping you warm and stylish, here are some tips on how to care for natural fur. Your fur coat should always be hung on a broad, sturdy padded hanger to keep the shoulders from losing their shape. The neck of the hanger should be long enough to keep the collar of the coat away from the hanging rod. Do not hang a fur in a garment bag, especially a plastic bag, that doesn't breathe. The fur needs air circulation to keep the hide from drying out and cracking. Opt for a 100 percent cotton bag to keep dust out of the fur. The cotton bag is also easily washed. Do not leave jewelry pinned to your coat as it can mat the fur. When wearing your coat, do not use a shoulder bag consistently because it can wear away the fur and leave a bald spot. Wearing a scarf around your neck will prevent body soil and make-up from soiling your coat collar. Avoid using hairspray or applying perfume when wearing your coat. The formulas of most brands contain alcohol which can dry the hides. Any oils in the products may penetrate the fur and eventually become rancid. The odor is nearly impossible to remove. If you will be sitting for a long period of time, you should take your coat off to avoid crushing the fur. If you can't remove the coat, try to change positions often so that the fur will not be crushed in one spot over and over again. If possible, remove your coat and use it more like a blanket in your lap. If you have a natural or faux fur hat, take special care if it becomes wet. Proper reshaping is necessary to help these hats hold their shape. If you get caught in light rain or snow, simply shake out the fur and remove as much water as possible. Hang it to dry in a well-ventilated room. Do not use a hair dryer, clothes dryer, or any direct heat on the fur. After it is dry, shake again to fluff the fur. Do not comb or brush the fur, simply smooth the fur with your hand. If your coat gets completely soaked with water, it should be taken to a professional fur cleaner immediately so the hides can be treated correctly to prevent shrinkage. A natural fur coat should be cleaned every year by a professional fur cleaner, not a dry cleaner. 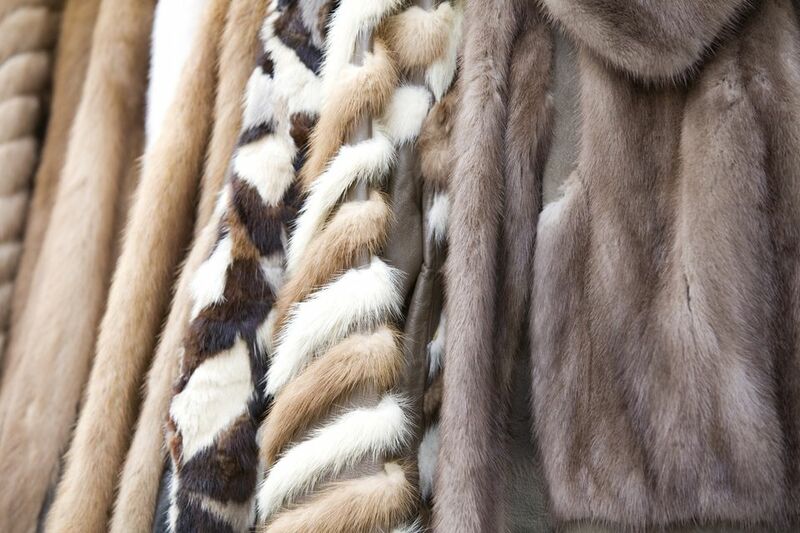 Even if you don't wear it often, animal fur gathers dust, oils, and odors. A professional cleaning will add luster and shine to the fur and keep it from becoming matted. A fur professional will inspect your coat for stains, rips, and tears. The linings are hand-cleaned with specific attention to spots and stains. The fur is then placed in a large drum filled with sawdust and an environmentally-safe cleaning solution. The coat is tumbled in this drum which draws the dirt and oils from the fur. The coat is then vacuumed to remove the sawdust and hand steamed to remove any final residue. The next process involves "electrifying" the coat. Using large rollers, electricity is used to make each hair lift, separate, and lie in the same direction. The process is similar to static electricity that makes each of our hairs stand separately on our heads. Fur hates heat. It is not the actual hair that is affected, it is the hide or leather that can dry out, become stiff, and crack. The optimum storage temperature for natural fur is 45 degrees F and 50 percent humidity. In fur storage vaults, the room is dark which prevents bleaching and fading of the color. Moths and other insects cannot survive at that temperature. Furs that are properly stored during hot weather can last up to fifty years or more. If you decide not to use a professional storage facility, do not store your coat in a cedar closet or chest. The oils can harm the fur. Keep the fur in the coolest closet possible and always in the dark. Check frequently for insect activity, especially moths.